China, Spain should jointly build Belt, Road, president says. China would like to maintain high-level exchanges with Spain and for the nations to continue to support each other’s core interests and major concerns, Xi said, adding that they should uphold the right direction in bilateral relations. Noting that this year marks the 40th anniversary of China’s reform and opening-up, Xi said that China and Spain have upheld developmental paths that fit their own situations in the past four decades and have achieved national prosperity and social progress. The Spanish Senate and Congress of Deputies can play an important role in boosting China-Spain political mutual trust and deepening the friendship of the people, Xi said, adding that China attaches great importance to exchanges with the two houses of Spain’s legislature. On behalf of the two houses, Pio Garcia Escudero, president of the Senate, welcomed Xi’s state visit. The Spain-China relationship is the best of all time now, he said. He told Xi that Spain admires China’s great achievements in reform and opening-up and speaks highly of China’s important role in global affairs. 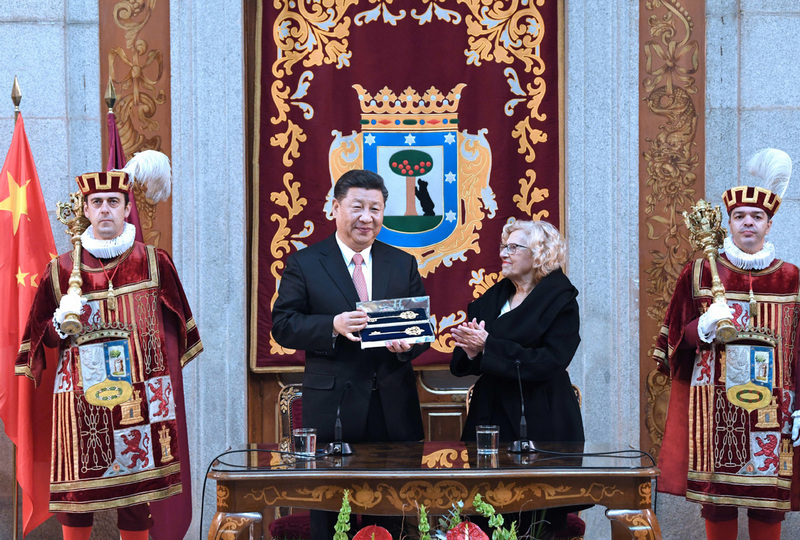 Carmena said the connection between Madrid and China has become closer, and China’s Spring Festival has become a popular festival in Madrid. Xi’s state visit will bring more opportunities for Madrid to enhance cooperation with China, the mayor said.